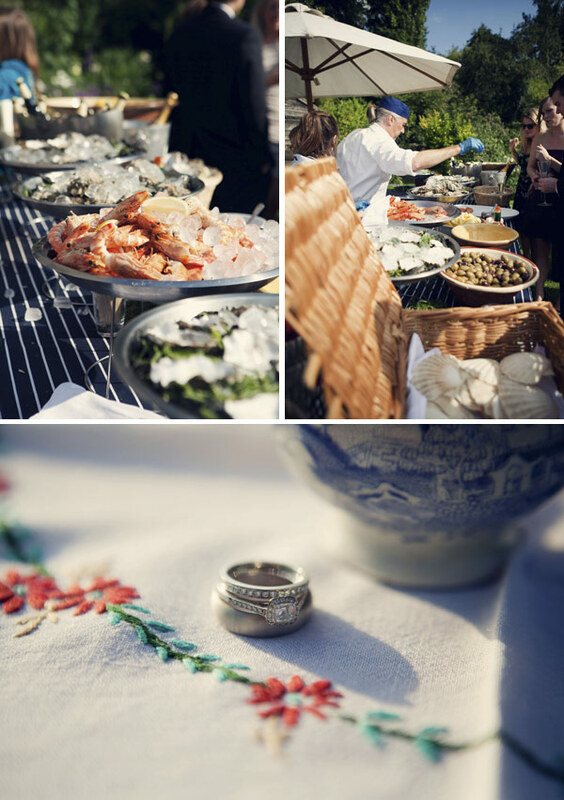 A Back Garden Wedding With Caro Hutchings Photography. 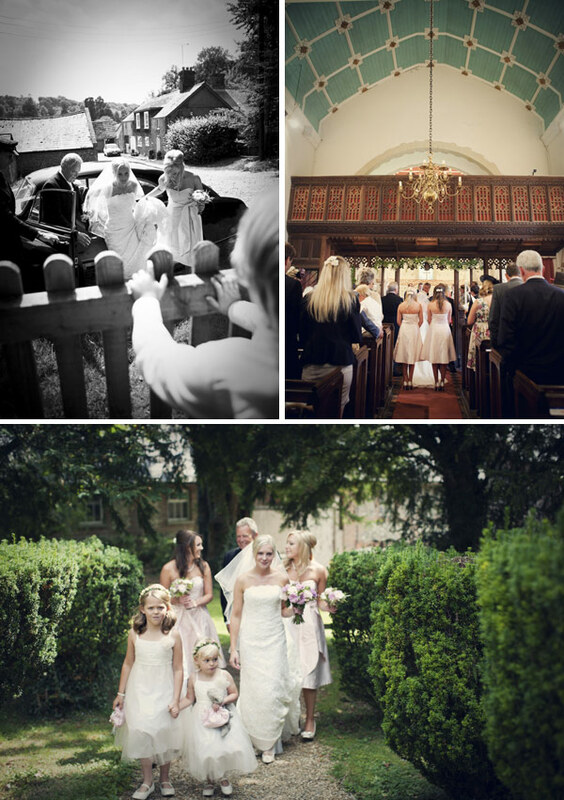 Today’s wedding brings with it a mixture of soft ivory and pink hues, rustic styling and back garden charm. 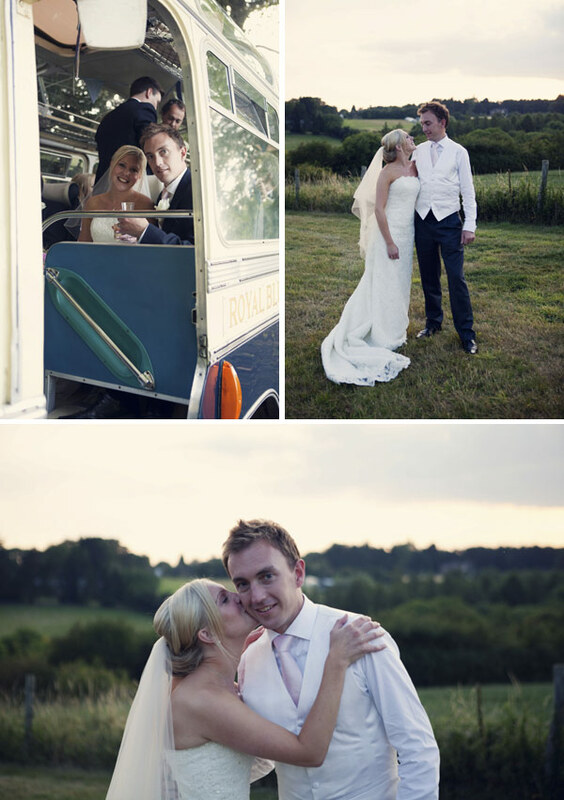 Hannah and Digby escaped the hustle and bustle of London life for the countryside and they wanted their wedding to be a celebration in their new location. 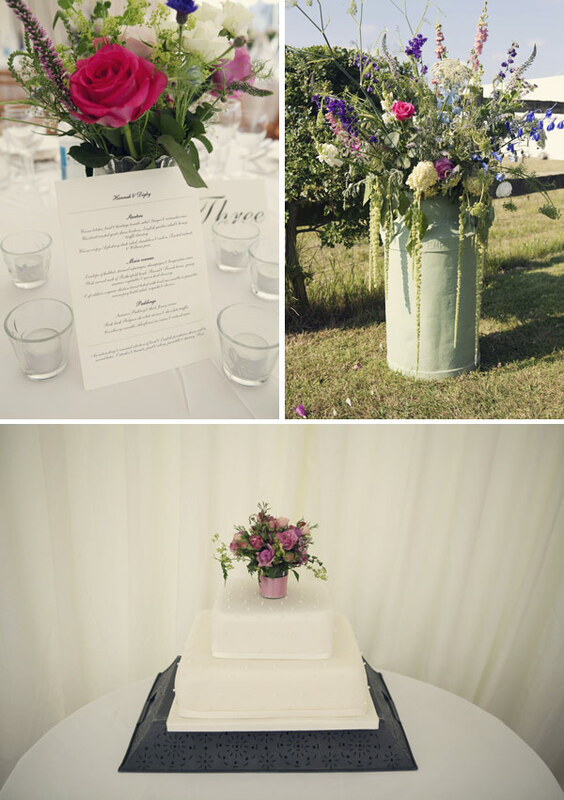 A Marquee gave them a perfect blank canvas on which to realise their theme and personal touches like home arranged flowers and a D.I.Y cake have really made their day unique. Photography today is by Caro Hutchings. I am Hannah, and my husband is Digby, we met locally about eight years ago. Although secretly hoping that engagement may be on the cards (after seven years) Digby managed to surprise me completely with a proposal, in snow covered Edinburgh and a romantic stay at the amazing Witchery. 19 months later we were married on 30th July 2011. Having spent the first years of our relationship in London, we made the big move out to the countryside where we both grew up, a year before the wedding, so it was fitting that we had a country themed wedding day. The church was very near my parent’s house, a beautiful, tiny Norman church surrounded by woodland on one side and rolling hills on the other, St botolphs, Swyncombe. We packed 120 guests into the church for an intimate service. A blue and cream vintage 1960s bus then transported us and our guests to the reception which was at my parents-in-law’s beautiful home where they had erected a marquee in their field in Peppard Common. I knew that I wanted a simple strapless ivory dress, but did not think that I would want any detail. However, as soon as I saw and put on my dress I knew it was the one, beautiful lace with beading, scalloped edges and a small train. I found my dress in The Bridal Room In House of Fraser, Oxford Street. The designer is Augusta Jones and the style is Sterling. The bridal room were great, altering my dress as needed, and putting up with me popping in to try the dress on again and again with various accessories and relatives. I went for simple, gorgeous, single drop pearl earrings and necklace that Digby had given me before the wedding. I added a gold tinted veil also from the The Bridal Room to my hair, but left the overall look natural as I did not want to take attention away from the dress. I found my shoes before any other part of my outfit, they were kitten heel, ivory satin with knot detail over the toe, they had to be elegant but allow for a a night of dancing! My lovely wonderfully talented friend Katherine Moor made me up in very natural pinky tones. I knew that I wanted to have a simple loose roll up do which my fantastic hairdresser Jenny Adore styled to perfectly tie in with the dress and theme of the day. 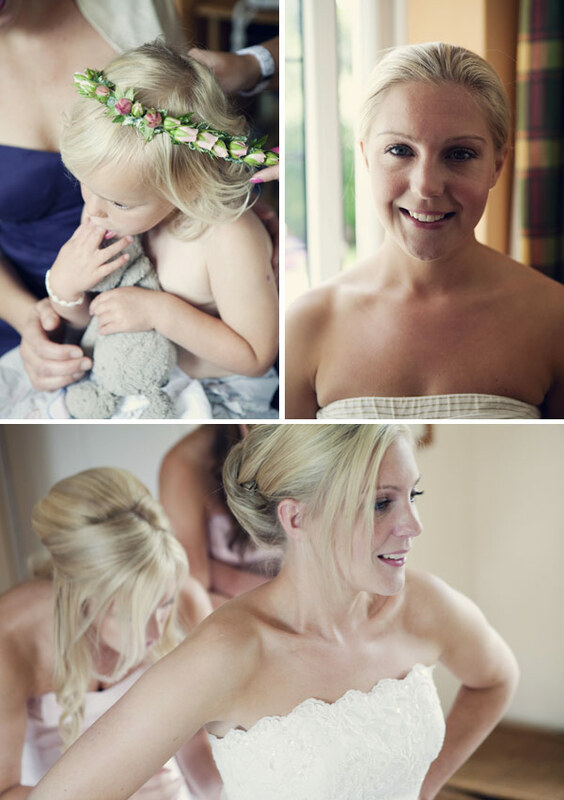 White Gdn in Henley produced beautiful bouquets of pink and ivory roses for myself and the bridesmaids, with adorable flower garlands for the little ones hair. They also did the button holes for the men. My wonderful mother in law with the help of her friends did all the flowers in the church and marquee, as well as table centre pieces. To name a few of them we had, delphiniams, ammi, scabious, larkspur, cosmos, roses, fennel, foxgloves, which set the whole country flower tone for the wedding. My mother in law had also planned her garden to perfection during the year so that it was in full bloom and even colour coordinated with the colours of the wedding. It really did look absolutely beautiful. The theme was a country wedding with Ivory and pink colours. I had the best bridesmaids, my two sisters. They supported me through the whole wedding process, organising me the most brilliantly fun hen weekend in Bath. 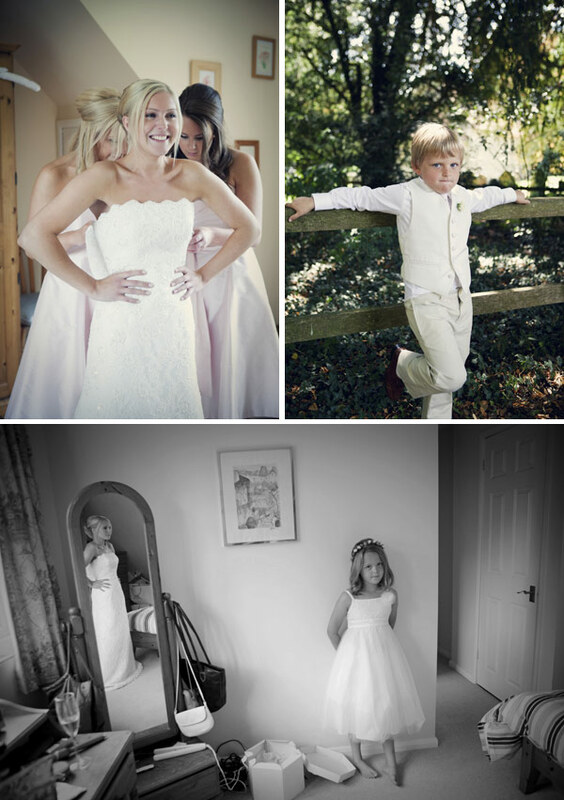 I wanted to find dresses that my sisters both loved, we were not sure that we would ever find dresses that suited them both, but we eventually found gorgeous, baby pink silk dresses in Coast, these were finished off perfectly with pearls. The two little bridesmaids are my cousins beautiful children. We found their adorable dresses in Monsoon, they also has the most fabulous sequined shoes which my cousin found. The Males in the wedding party, including page boy Fred hired their outfits from The Wedding Centre in Marlow, some had their own suits. Digby wore a traditional morning suit with pink tie and ivory button hole. Digby and local guests arrived at the church on the Bristol MW Bus ‘Royal Blue.’ I broke with my traditional lases faire time keeping and was near enough on-time! I walked into the church and my nerves melted away when I saw Digby standing at the alter smiling at me! We chose Caro Hutchings to take our photographs. Having seen her work at a friends wedding, we were convinced that her photos would fit with the natural informal theme of the day. We were not disappointed; Caro really captured the happiness of the day and we have beautiful photos to remember the day by. My talented Auntie Val made the ivory Cake. I knew that I wanted a simple traditional white royal iced cake which after a discussion, my auntie designed and was more perfect than I could have imagined. Square, two layer with one layer fruit and one layer chocolate Madeira – yummy! My mother in law put some of the flowes from the garden in a little vase on the top which finished it perfectly. I had only one band recommended to me when i started asking around. Flip Side Jack who are a local band including some of my old school friends. They were wonderful, going with the flow of the evening and playing covers from the last four decades which got everyone up and dancing all night! Not being huge music fanatics, or the best dancers, we did not know whether to have a first dance that we danced alone. Following much deliberation, we decided go with one of my favourite songs that we could have a fun dance too, then get everyone else quickly on the dance floor with us! Dusty Springfield, son of a preacher man was the song that we choose. To fit with the country theme, we had the reception drinks in my grooms parents beautiful country flower garden, the weather was brilliantly sunny and the champagne and elderflower cordial flowed. The canapés were amazing, Paul Clerehugh from The Crooked Billet brought to life our vision of a vintage garden tea party with scones and mismatch of tea cups, crossed with lavish canapés and a sea food bar including oysters and king prawns and thanks to my farther in law we had a locally brewed beer station with a giant pork pie and piccalilli. Within the gorgeous open sided marquee that overlooked the valley were more country flowers, vintage stepladders, milk churns, pales, Victorian celery vases for the table centrepieces and tinted uplights. The fabulous food by Paul Clerehugh continued in the form of a wedding breakfast for which, on entering the marquee, guests had a choice of three delicious options for each of the three courses. He supplied the kids with the most beautiful hampers full of picnic food and games to keep them occupied. Lots of flowers were always all around, hay bails, tea lights and luggage labels as name places were all other touches that added to the feel of the day. My brother in law, Barty, was crucial to the organising and running of the day and added in a few surprises that added a unique touch…… Following the vintage bus, with Digby being a keen golfer, a white ribbon adorned golf buggy arrived to take Digby and I as well as the bridesmaids and page boy along to the reception which was great fun. Later on in the evening, when the dancing was well under way, in came a pink wheelbarrow full of ice, glowsticks, indoor fireworks, cocktails named after the ushers, spirits and shot glasses which were popular with many of our guests! A pink wheelbarrow full of booze and fireworks? Well, that’s a new one on me… I love how proud Barty looks though upon presenting his treasures to the guests. 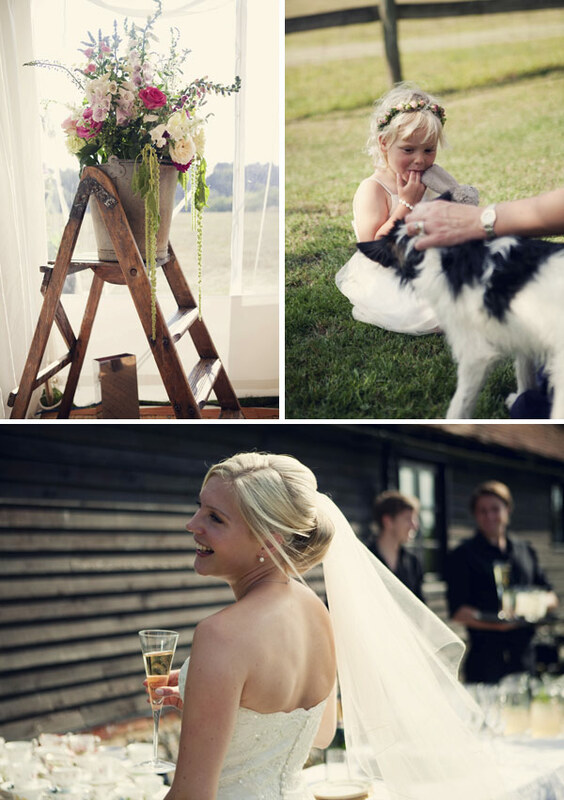 The rustic country theme works perfectly for a marquee reception and Hannah and Digby got their vision spot on. I don’t often mention the food but it looks to me as though The Crooked Billet did an amazing job too. Thanks to Hannah and Digby for sharing their day. Aside from everything else in this wedding that I would muchly like to have, please could I have a hairdresser called Jenny Adore? Amazing name! Those shoes are just what I’m looking for – Hannah, could you provide details? That cake topper is so clever, how did you make it? was it a mini vase? What an INSANELY gorgeous Grace Kelly-esque bride! i wish i had also been there! beautiful day with a beautiful couple. Kudos for The Witchery! would love to stay there! We fly back into Edinburgh from our honeymoon in Sorrento in July. We are staying the night at The Balmoral as couldn’t get The Witchery. 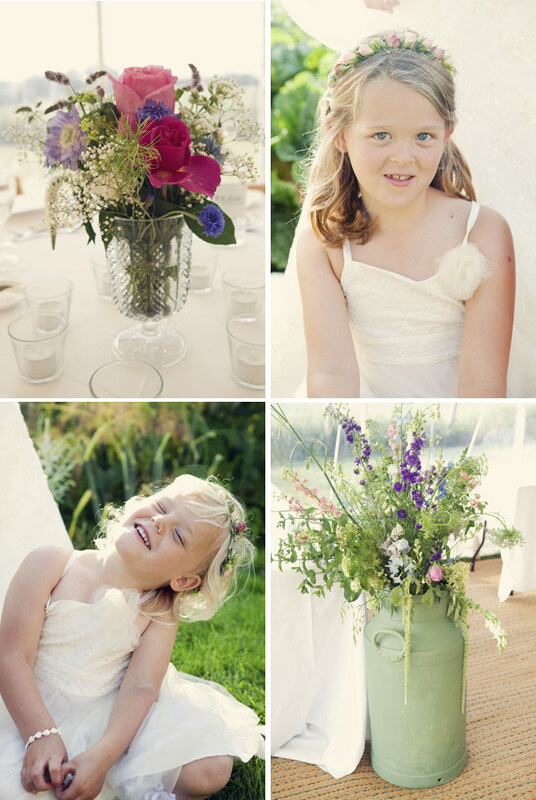 A Beautiful bride and an equally lovely selection of blooms – I want a giant urn filled with pretty please. Thank you all for your comments, it was an amazing, wonderful day! My shoes were from House of Fraser, Linea was the make, I will try to find out the style! The cake topper was made by the florist, it was just held together with thick ribbon and wires. Hi Jenny – I hope that you are well!